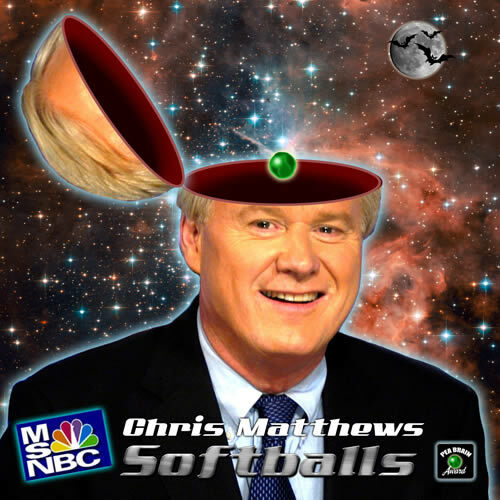 Chris Matthews, the hyper-salivating screamer on DEMS-NBC, will tonight regale us with his special on the advancing and frightening right-wing who scream of tyranny and overthrow. In a script that could have been written by James Carville, every group is lumped together as subversive and dangerous. To be sure, there are a slew of those folks, but I never heard Chris speak against those who demanded Bush’s impeachment or arrest. The same for Cheney. And there was validity in that, believe me. DEMS-NBC is the Fox News of the left and the most partisan is Dr. Spittle. The simplicity of this man’s message and the partisan Obama worship render him useless as a viable or significant voice. There simply is no valid and responsible political commentary on MSM news. Period. The truth is incapable of being reported apparently. When will even Fox delimit Obama’s lies about rendition and torture and war? They can’t because they’re Bush’s lies. Even they have their limits. The truth is in the Internet, alternative media and international coverage.